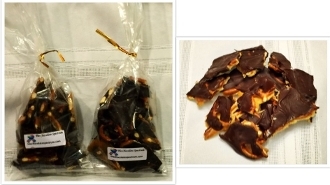 NOW two different flavors: Chocolate Caramel Pretzel Bark-The delicious combination of dark chocolate, pretzels and caramel with just a light sprinkling of sea salt. Or Chocolate Caramel Toasted Almond-Almonds, Milk chocolate, caramel, sea salt. Need we say more! This selection includes one pound of bark. Add more and save!